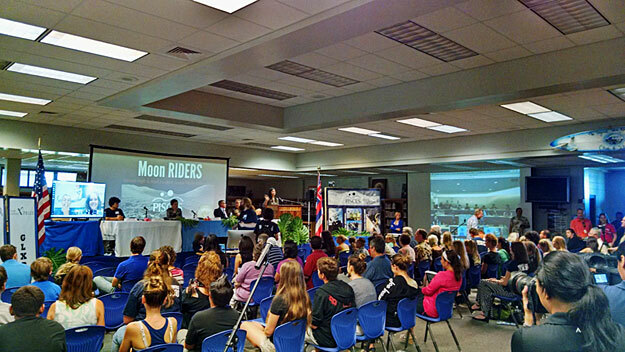 PISCES announced this morning the two participating Hawaii high schools selected for the Moon RIDERS (Research Investigating Dust Expulsion Removal Systems) student lunar flight experiment during a dual-location press conference on Oahu and Hawaii Island. Kealakehe High School in Kailua-Kona and `Iolani School in Honolulu have been selected in the unprecedented STEM project partnering PISCES with NASA's Kennedy Space Center to involve students in a real-life lunar flight experiment that will be flown to the surface of the Moon. The press event included messages from Hawaii's Governor and U.S. congressional leaders, as well as presentations by NASA Swamp Works, educational leaders, and participating students. Hawaii Governor David Ige opened the conference with a brief video congratulating students from the chosen schools. "This is a first, and I am extremely proud of the `Iolani and Kealakehe high school students who have been selected to send their science experiments to the surface of the moon," said Gov. Ige. He called the partnership significant for workforce development, adding, "It's an example of a successful collaboration between public, private, commercial, state, and federal sectors to make a project of this magnitude possible for our students." Congresswoman Tulsi Gabbard also shared a video message at the event, lauding the Moon RIDERS effort as a STEM initiative promoting technological education and training. The keynote speakers at the press conference included PISCES Executive Director Rob Kelso, Hawaii Department of Education (DOE) Superintendent Kathy Matayoshi, Kealakehe Principal Wilfred Murakami, and `Iolani Head of School Dr. Timothy Cottrell. Other Hawaii representatives from the U.S. Congress submitted letters of congratulations and support, including Sen. Brian Schatz., Sen. Mazie Hirono, and Rep. Mark Takai. Dr. Carlos Calle of NASA's Swamp Works at Kennedy Space Center, the chief scientist behind the EDS (electrodynamic dust shield) technology the students are testing explained the system's significance and inner-workings, as well as the benefit for space exploration the students work will have. Superintendent Matayoshi called the recognition of a student lunar flight experiment a "chicken-skin moment." "One of the things that this project exemplifies is that science is fascinating to students when they can do it. Not necessarily when they just read it on a book. You've got to see it, feel it, and be able to work with it, and then it comes alive. And I think that's what this experiment does," said Matayoshi. Kealakehe Principal Wilfred Murakami thanked Matayoshi for her nomination. "It was because of her nomination that we are a part of the project. What a great day for education... here in the State of Hawaii today." "This is a fantastic, a once-in-a-lifetime opportunity for our kids. `Iolani chose to participate for a number of reasons but, first and foremost for our kids. This is exactly what we're always looking for. We want real, authentic problems that our kids can tackle. This fit the bill and they've done a magnificent job on the project," added Dr. Timothy Cottrell, Head of School at `Iolani. Josiah Clark, Student Project Leader for Kealakehe said he hoped the project would stimulate discussions in STEM education and the role space exploration should play in society. "If you care about education and workforce development, you should care about space exploration. Moon RIDERS breaks this mold of classroom learning requiring high technical skill, unrelenting perseverance, and a little bit of crazy - a prerequisite for all great things," Clark said. "Moon RIDERS is a step toward engaging the younger generation to seek out the unknown, and hoping that they find a solution in the answer," said Veronica Shei, Student Project Lead for `Iolani School. Students will be running their first series of pre-flight testing for the experiment beginning in March, 2015, in preparation for the anticipated late 2016 launch date. The tests will be conducted at a PISCES planetary analogue test site on Hawaii Island. For more information on the PISCES Moon RIDERS project, visit pacificspacecenter.com/moon-riders/.